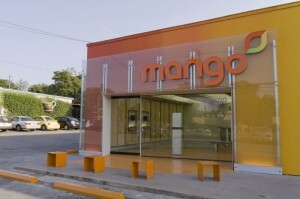 This modern design can be attributed to Bercy Chen Studio, one of Austin’s most fashionable architecture firms and rather upstages Mango’s close neighbours: a pawnshop, petrol station and fast-food outlet. 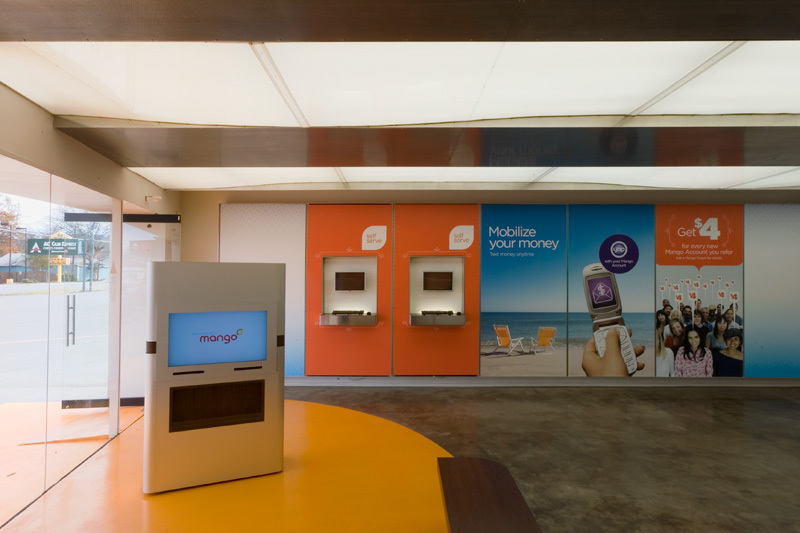 Mango exists to provide financial services to the un-banked and under-banked members of society and the company’s attractive new look has sharpened the cutting edge of their forward thinking business. None of these products would be likely to succeed in the mainstream financial market, so Mango has the un-banked niche, where their business is thriving. Official figures estimate that 7.7% of US households are un-banked. This means that at least 17 million adults have no checking or a savings account. The extent to which sections of US society is un-banked varies wildly between different ethnic groups. Amongst black Americans 21.7% of households are un-banked, Hispanics: 19.3%, American Indians & Alaskans: 15.6%. At the other end of the scale Asian groups stand at only 3.5% and white Americans at 3.3%. An additional 21 million Americans (17.9%) are considered under-banked.These are people who do have a basic checking account, but do not have an integrated approach to managing their finances. For example, under-banked people use non-bank money orders, non-bank check-cashing services, take out payday loans, have rent-to-own agreements and perhaps use pawn shops or refund anticipation loans. Often people are forced into an un-banked position due to factors out of their control. Recent economic turmoil has lead banks to be much more careful about who they deal with and poor credit scores seriously restrict financial options for many, consumers are finding that they reach a dead end. Legislation that was introduced specifically to protect consumers from greedy bankers has also had the unfortunate consequence of restricting availability of credit cards and regular bank accounts. The Dodd-Frank act places a cap on the fees banks can charge retailers for card transactions. To recover this erosion of their revenue streams Bank of America, Wells Fargo, Citibank and JPMorgan Chase are all preparing to withdraw free checking accounts from the market and will mean customers have to pay for an account. This will encourage even more consumers towards the un-banked and under-banked end of the market, opening the door even wider for companies like Mango Financial. However organisations like Mango are in a very tough market and they cannot go it alone. As this sector becomes more mainstream and shakes off the image of being slightly less than legitimate consumers will begin to see a genuine alternative to the regular banking scene that is becoming an inhospitable place to be. 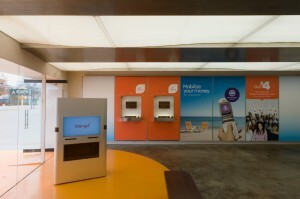 Self-service facilities are increasingly playing an important role in this industry and the demand for financial services kiosks are seeing robust growth. The Genkiosk platform is used by such organisations to bring their self-service solution to market and once launched business stay on top of their kiosk operation via the Genkiosk management tools.